After five attempts at obtaining an Australia Council ArtStart Grant, local emerging artist Rose Rigley has at last been successful in obtaining funds for the future of her arts practice. The ArtStart Grant program was created to give up to $10,000 to recent arts graduates, assisting them to transition from studying to having a professional career in the arts. In this highly competitive process, grant applications from across Australia were assessed by a panel of peers and funding awarded on merit to a select few. Rigley graduated from Tropical North Queensland Institute of TAFE with a Diploma of Visual Arts in 2011 and has since gone on to hold four solo exhibitions. She is a founding member of Knock Knock, an artist-run initiative, which organises an ongoing program of curated exhibitions and community engagement events. The ArtStart Grant will allow her to create new connections, refine her skills with a mentorship and expand her individual arts practice beyond the region. ‘I nearly didn’t apply again after four unsuccessful attempts, but a friend encouraged me to have just one more try’, says Rigley. ‘I couldn’t believe it when I got the approval and I had to re-read it so many times to make sure. Gaining the grant means that the next twelve months will be very busy as I undertake activities that will be pivotal to the longevity of my arts practice. The grant has given me a stronger belief in myself as an artist and the confidence to pursue my creative goals regardless of knock-backs and challenges,’ she says. Rigley’s next solo project, THREE DOGS are one, two, many will be held at Vivo in the heart of the Palm Cove. 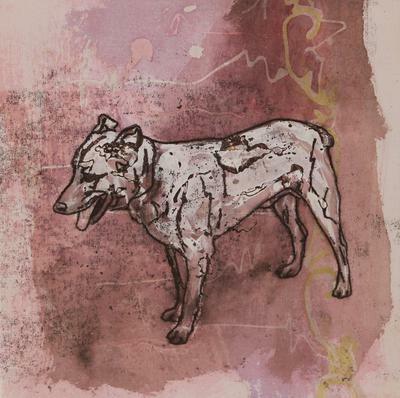 The exhibition focuses on memory, mortality and the deceptively simple connections between humans and their dogs. The official launch is on Friday 30th of May from 5.30pm, with the exhibition continuing until the 21st of July 2014. Whether purebred or of indeterminate linage, ‘man’s best friend’ has established for themselves a social niche within human society. Rigley ponders why dogs have such a deep effects on humans. The artist combines personal symbolism and mixed media to further pursue the elusive notion of memory.